Submitting reports is a fun and easy way to paint a living picture of your local resources. Document your favorite steep creek run, a morning dawn patrol at your local surf break, or any memorable moment on the water through a Water Reporter report. We’ll ensure your reports are mapped, added to your profile, and made available for others to view in our community. 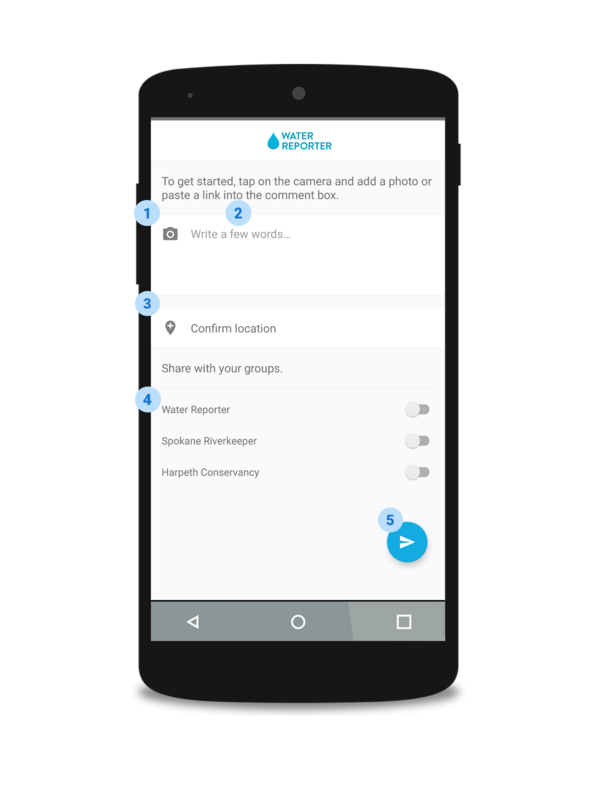 Our mobile app is the fastest avenue to add a report in the moment or you can leave the smartphone at home and share a report through WaterReporter.org when you’re back online. Tap on the camera to either snap a photo or add an existing one from your photo roll. Tap the comment body and type a description to describe your post. Remember, you can always use hashtags to classify your report with others like it in the community. Water Reporter will plot your location but we want to make sure your report appears where you want it to on the map. When you confirm your location, you can always fine tune or launch the pin to a completely different area by typing in an address or coordinates. When you are satisfied go ahead and tap the check mark in the top right corner. All of your groups appear on the bottom of the screen. Toggle on groups that you want to make aware of your report. Your post will be included in that group's feed, on the group's map, and administrators are notified that you’ve shared the report. Tap the send button and it’s off! Keep in mind you can always go back and edit a report’s date, comments, location, or group(s).